After sharing some early Q4 2015 results last month, T-Mobile today spilled all of the details of its end-of-year 2015 performance. In the final months of 2015, T-Mobile added 2.06 million new customers. That includes 1.29 million postpaid subscribers and 469,000 prepaid customers. This makes Q4 2015 the 11th straight quarter that T-Mo has added more than 1 million customers and the third straight quarter that it added more than 2 million subs. The total number of customer adds for 2015 finished at 8.26 million, and T-Mobile ended the year with a total of 63.28 million customers. Postpaid churn for the quarter finished at 1.46 percent, down from 1.73 percent in Q4 2014. Flipping over to financials, T-Mo pulled in $8.25 billion in service revenue in Q4 2015, up from $8.15 billion in Q4 2015. Net income for the quarter was $297 million, up from $101 million in Q4 2014, while T-Mobile’s total yearly income grew from $247 million in 2014 to $733 million in 2015. Finally, T-Mobile today gave us an update on how its network is doing. T-Mo LTE reaches 305 million people, while its 700MHz Extended Range LTE coverage reaches 190 million people in more than 300 markets. Also included in today’s release is the news that T-Mobile has acquired more 700MHz spectrum that covers around 48 million POPs. The spectrum was purchased from multiple groups and the deal was struck just this month. Unfortunately, those are all of the details that’ve been given so far, so it’s unclear where in the US this 700MHz spectrum is located. Looking ahead, T-Mobile says that it expects to add between 2.4 million and 3.4 million postpaid customers in 2016. That’s a bit lower than the 4.5 million postpaid adds that T-Mobile saw in 2015. As a reminder, T-Mobile will be live streaming its Q4 2015 earnings call that’ll be kicking off at 8:30 am. T-Mo has even created a drinking game to go along with the call. To take part in the game, or just watch as John Legere and Co. discuss their Q4 2015 results live, check out the YouTube embed below. ughh i would really like to know more about the new 700 MHz purchased! Me too. I live outside of Boston and despite all of TMOs claims about 700MHz my service still stinks. Twenty miles outside of a major metropolitan and I float between 4G and E at my house. I also travel throughout New England and most of the time I have no service at all. I have an iPhone 6s Plus and live in East Boston, MA. I have traveled in and around of the Boston area and have yet to pick up 700Mhz service. I’ve done multiple field tests and I’m almost always on band 4 (1700/2100). I don’t think the 700Mhz is live yet in greater Boston area. 700Mhz is not a main band, it is more of a backup band to Band 4. If your phone stays with Band 4 it means it doesn’t need Band 12. Band 12 is much slower than Band 4. It does have more reach, though. I’ve seen B12 in Arlington, Cambridge, Belmont, Acton, Littleton, Westboro, Hopkinton, Wareham, Bourne, Rochester, New Bedford, Westport (even covers Cuttyhunk (Mass locations) – also all over NH – Littleton, NH has B12 (that’s way north, up by Franconia Notch). It’s being deployed aggressively. I’m sure we’ll see more. i live in Quincy and I’m constantly picking up Band 12 indoors. Your phone will switch to band 12 when the band 4 signal is too weak. If you’re in a great coverage area, you won’t see band 12 even though it’s there. one thing i noticed here in los angeles on my lg stylo and moms galaxy s6 is that they on band 4 lte 99% of the time ONLY time both phones switch to band 12 is when inside a store or elevator and band 4 gets weak ,band 12 kicks in on both phones and works great im able to get signal on many stores were before i had nothing. Once im outside both phones are on band 4 All the time and i mean all the time they never ever show band 12.
good thing they on band 4 most of the time because the few times i had band 12 and ran speed test they are pretty bad less than 5 mbps ,band 12 works great to call in places i wasnt able to before but its slooow compared to band 4 on band 4 i can get up to 30 mbps. Thanks, but I’ve been deep inside buildings and still haven’t picked up band 12. I’ve picked up a weak 4g signal, Edge or no service. I don’t think T-Mobile officially launched band 12 in Boston yet. I don’t think T-Mobile officially launched band in Boston yet. They haven’t. But it’s out there, and they’ll probably announce it soon. That doesn’t mean that you’ll pick it up everywhere immediately that has a bad signal because they’ll still be adding sites. I’m on the south shore, and it started off with one tower in my area right after Labor Day, and since then, it has expanded to more towers. Just know that it’s been my experience that the i-Phone holds onto band 4 for dear life…especially compared to my Nexus 6. They’re still working on it. They can’t simply flip a switch. They are adding equipment. Band 12 isn’t even officially live here yet anyway, though based on what I heard on their earnings call, they implied we are. That’s what i noticed at a recent trip to a ranch in the countryside. Though impressed that I had a healthy B12 signal even with no tower in sight, depending on the terrain, the phone would still fall back to EDGE sometimes. Apparently, the lighting up of LTE on the countryside was at the expense of HSPA, which provides much more useful speeds than EDGE. No can’t be. HSPA is only provided on 1900 MHz so B12 LTE on 700A MHz cannot replace HSPA. It’s just that those areas you’re referring to where the phone drops to Edge never had HSPA installed in the first place. I see. I guess that the M2M market makes TMUS refrain from dumping EDGE. Of course, it’s doubtful that, when it does dump EDGE, the spectrum would be converted to HSPA. Though HSPA would work better than LTE when the signal is weak, unlike LTE, it lacks flexible channel bandwidth, using no less than 5MHz, which is quite an usable channel width for LTE. Quite unfortunate, for TMUS committed to EDGE until 2020 to its M2M customers. Quiet period I think begun already. But I am hoping for some north Florida love. same here, im in the jax area. Band 12 will absolutely make North Florida an even better experience. T-Mobile in the last year, at least in my area has fixed 99% of its coverage holes and the speeds are consistently fast. Sprint on the other hand decided to turn to crap in the last year. Made the switch and it’s night and day difference. Even on B4, I always have better signal inside buildings than I did on Sprint due to Sprint’s lack of site density. Sprint in my area has always been rubbish. I had them because they offered an unlimited Wimax hotspot for $40 when I combined it with my regular voice service. As soon as they put a data cap on there I was gone. its nice to see sprint customers converting to t mobile,m i referd alot of spring post subscribers to t mobile and they have experiences like yours. its like night and day. welcome to t mobile. Did they purchase from the rivals? Spectrum squatters. People that bid on the spectrum when it was auctioned and they held onto it for it to appreciate in value without building any of it out. I have no idea, they didn’t really say anything about it. I feel the same about wanting to know more about the 700mhz. I hope the bought from C-Spire and get the South Alabama area covered soon. Mobile Bay area needs it badly. The city is fine, outlying coastal areas suffer currently. It’s better to engage in roaming agreements with other carriers than to buy their spectrum or them. It’s even easier to reach such mutually beneficial agreements with local carriers. And it keeps the costs to us consumers down. Sure, but its already says they purchased it from multiple groups. So that point is kind of irrelevant now. I just want to know where it was purchased. I’m hopeful for the Mobile, AL Market. I love the word play, #1 in postpaid GROWTH, #1 in revenue GROWTH, #1 in adjusted ebitda GROWTH. More TOWERS than Verizon. I hope there’s talk of 5G since Dumb & Dumber will have city-wide testing by the end of the year. It would be bad for revenue GROWTH if T-Mobile was last to the next best thing again. I think they’re smarter than that now. they’re not going to sit on their hands for that long again like they did with LTE. but waiting for the other companies to start first isn’t a bad thing. there isn’t even a definition of “5G” yet. I understand where you’re coming from, but no one knew what 4G would be either. WIMAX or LTE. I’m not saying build it nationwide, just a citywide test trial in a city like Las Vegas. 5G is nowhere near a thing yet. It’s at best, a marketing term at the moment. Keep in mind 5G is 5th Generation. Also that T-Mobile has newer technologies out there since they updated to LTE more recently. Nobody knows what 5G is going to be, for the standard proposals are still wildly different. Anything about 5G is purely speculative and expensive. 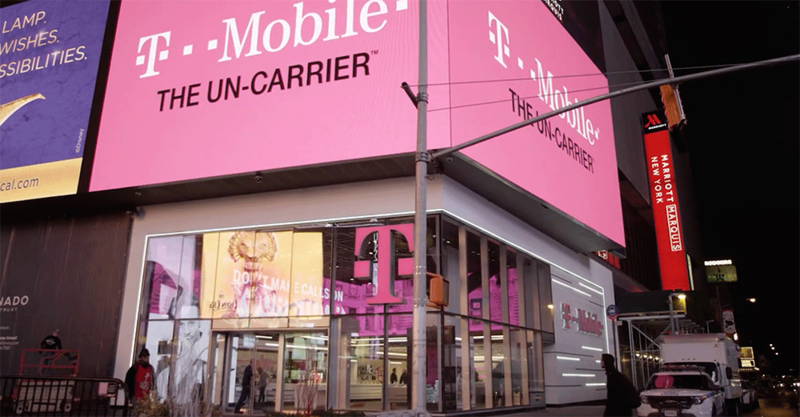 T-Mobile, and its customers, are better off sitting this publicity stunt out. Ha, well said my man. I always get a good chuckle out of reading the executive summaries of T-MO’s quarterly reports. They feature obscure and unclear metrics that lead me to believe they are trying to hide the facts. You have to get multiple pages in to get to the numbers, and they only show those because they’re mandated by the SEC. VZW lists their cash flow report right on the front page. Yep, Verizon is still spending a higher percentage of total revenue on capital expenditures. That’s the only way to sustain long-term growth. T-Mobile didn’t learn their lesson the first time around, and now they’re back. Soon, they will fade, then i’m sure they’ll re-emerge. Is 700 mhz same as Band 12? Yes and no. Band 12 is in the 700 Mhz freq. There’s several bands in the 700 Mhz, B12, B13, B14, B17. B13 and B14 are upper bands, thinks 750-800Mhz. B12 and B17 run concurrent but B12 is wider and actually starts in the upper 600. If t mobile wins 600mhz spectrum. Will the 700mhz that is currently deployed interfere with eachother? I don’t see how interference will come into play considering Verizon’s upper 700 MHz holdings are well above 750 MHz. If anyone should be worried about interference, it’s T-Mobile. Considering the fact that their Band 12 uplink is directly adjacent to the proposed 600 MHz band. Hope the mods allow this link. It looks like A LOT of coverage will be added by year’s end. That’s all new coverage to be added in the nearest future? Buildout requirements take effect by the end of this year. Unless T-Mobile’s had FCC grant them an extension during purchase of licenses. T-Mobile already has a reliable vendor supplying B12 panels so I expect to see some B12 love in these newly added areas likely by Summer. The buildout requirements? I think they are required to have 70% geographic buildout by 2017. I’d have to find it again. The 70% requirement doesn’t apply unless they miss the first, 40% buildout deadline (December of this year). Yeah, where’d you find that? is it accurate? If it is, that’s gonna be STOOPID AWESOME! Cover most of the western US and a lot of the Eastern side as well. According to http://specmap.sequence-omega.net/, those were all C700 and Cavalier. Individually owned LLC’s. That correspond to the “multiple groups” comment. Cool. I jumped to fast. Thanks for the link! 48 million when T-Mobile already owns most of band 12 means that Chicago license has likely been acquired by them. Thats at LEAST 10m alone. I can’t see them reaching 48 without that chicago license they obviously want. It’s also getting time for people to have to deploy or sell. Leap is obviously not deploying. San Diego and Las Vegas…….light them up, TMO !! BTW, how fast is band 12 anyway? Are we talking 10 Mbps or less? 5mbps from what I know but you can hit even 20 mbps. Depends. I don’t know the exact details. Runs about 8 down and 2 up. Not fast at all, but better than no service. San Diego won’t get it. Channel 51 is on the spectrum and they won’t give that up. Still no band 12 in San Jose and rest of the south bay area. I did pick up Band 12 at the San Jose convention Center it was pretty fast like in 44 Mbps down and 21 Mbps up. Hope to see Band 12 soon. no that’s not band 12. band 12 max is 37.5mbps. Looks like band 12 to me. I tried uploading a screen shot of the speed test showing band 12. Curious why their guidance for new subscribers is “only” 2.4M – 3.4M, down from the 4.5M in 2015? I’m pretty sure it’s a mix of being conservative with projections and expecting a harder time switching sticky customers. That’s the case. Remember they revised their 2015 guidance each quarter. It’s the Apple way of giving guidance. Been doing it for many many years now. More 700 mhz and Band 12 is nice, but I’d like to see T-mobile really emphasize that you might need a new phone to utilize it. A lot of people I know have phones that don’t support it, as those phones are around 2 years old or more, and they don’t want to get a new phone since their phones are paid off, but those old phones don’t have band 12. “XLTE” is not that useful to people whose phones don’t support it. Also, I wish T-mobile would make it easier for 3rd party phone vendors to support Band 12. So many cheap, but good $200 phones don’t support Band 12 because they’re not certified with T-mobile because of the whole voice over LTE and 911 service stuff. So many cheap, but good $200 phones don’t support Band 12 because they’re not certified with T-mobile because of the whole voice over LTE and 911 service stuff. VoLTE is the key – they must be VoLTE capable first. Because there is no other option on band 12. Band 12 is only LTE, so VoLTE is the only option for a phone call. You are correct that that is why, but T-Mobile is doing a really sorry job of verifying phones. The nexuses have been out 3 months now and have been fully capable the whole time yet we still are not band 12 enabled. The nexuses have been out 3 months now and have been fully capable the whole time yet we still are not band 12 enabled. my mistake. I missed that it actually got confirmed. The FCC should be the one certifying B12 with VoLTE and E911 phones from other manufacturers. I don’t trust T-Mobile. Or T-Mobile’s 700mhz ought to have a slice of GSM for phone calls, but I guess it’s too late for that. Please tell me that some of that spectrum covers SC and NC, we really need it out here. Most likely its Utah, Idaho, New Mexico, Texas, Ohio, the Chicago license, Pennsylvania, Virginia, Upstate New York, Georgia, and the NC/SC licenses US Cellular does not own. Everything else is unlikely to ever be sold. I had heard they were going to lease or buy US Cellular spectrum in Wisconsin. I hope they did, it’s a huge hole in their coverage. Depending on where in either NC or SC, the spectrum is owned by ATT, USC or a squatter. The latter’s is probably the only one for sale. there are still a lot of metro licenses of some decent sized markets in play even in those areas. Charlotte, Greensboro, Charleston, Savannah, Lexington, Louisville, Richmond, Colombus, Buffalo, Albany, Jacksonville, Tallahassee, Sarasota, etc. the list goes on. If I had to guess, by end of 2016 for sure. Modifying towers takes time. Its a government issue, not a financial one. OMG 48 mil POPs!!!! There’s a HUGE chance they bought Continuum 700 at 14 mil POPs! Hells yeah Jacksonville! Deadpool can finally come back and visit Jacksonville with a T-Mobile phone and not worry about coverage when he enters TGI Fridays! I think it was Cavalier they bought. Cavalier has 47 million 700-A pops. Excellent news on the additional 700mhz. I would really like to know the areas affected. hope tmobile one day buys up UScellular, or at least their spectrum. they are sitting on a huge amount of spectrum and hardly doing anything with it. Better and cheaper to just enter in a roaming deal with USC. This is the model in the EU and it works very well for carriers and consumers, whose mobile bills are between 1/3 and 1/2 of ours. I agree, I deal like that would be great for consumers and for maintaining competition. That buy buy mentality sickens me a little. Oh please please please let Oklahoma be part of the 700 MHz audition. T-Mobile didn’t participate because they were going to be acquired. It has more to do with a Cash Flow statement than anything. Pointy-Haired Bosses exist in every corporation. They have different management both stateside and in Germany than when the auction happened, so I don’t think you can give the current guys grief for the mistakes their predecessors made. I wonder if a priv from at&t will be able to take advantage of this? I’d love to see T-Mobile buy King Street Wireless and merge in USCC into their network. Between that an some odd spectrum from Cspire they could match Verizon and AT&T toe to toe. I’m surprised no leaks have turned up with respect to the licenses involved.